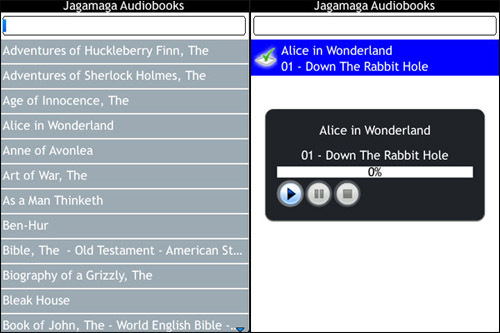 Jagamaga Audiobooks - Get hundreds of free audiobooks on your BlackBerry! Before eBooks were invented, we had these crazy things called books on tape. Some of you may remember listening to them in your car on long drives, or at home on quiet evenings. I'm sure those are still around, but it seems they have been replaced largely by eBooks, with mobile devices having apps to keep them organized and portable, and the invention of eReaders. It's not always practical to read however, for example while driving, so audio books still have a place in modern life. I found a cool app called Jagamaga Audiobooks in BlackBerry App World that provides hundreds of classic, public domain books in high quality audio format. You can download entire books or a few chapters at a time and save them to your device memory or SD card. To select where the downloads save to, use the menu button from the app's main screen. This is also where you can view and play the books you have downloaded, and delete them as well. The only app that offers professionally curated LibriVox audiobooks. Professionally mastered Public Domain audiobooks. Dynamic catalog updates with new free content. Over 200 titles…plus hundreds of free short works. Smaller files for fast downloading and wireless access. Carefully de-noised and edited for undisturbed listening. Browse by genre, title, author, and narrator. There is a free version of Jagamaga that offers over 200 titles, and a paid version ($2.99) that gives you access to the entire collection of books. This app is compatible with all BlackBerry smartphones on OS 4.5 and up, though there are some country restrictions.